Be a beautiful bride in this trendy vintage style ball wedding gown. Give an expression to the princess in you in this gorgeous wedding gown. 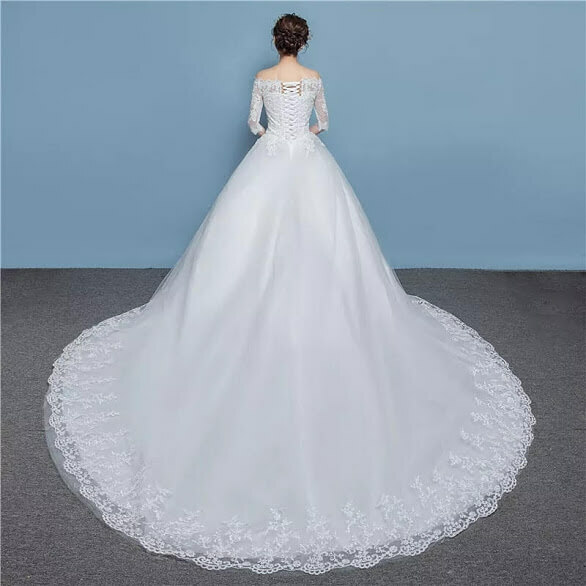 The wedding gown has a tail and the back of the bridal dress is lace up; this makes wedding gown easily adjustable. The wedding gown is off shoulder and it has sleeves. If you are looking for a wedding shop in Lagos, our store is at 8, Ajayi Aina Street, By Deeper Life Church, Gbagada, Lagos.